A total of thirty isolates of Phomopsis vexans were collected and studied for their variability. It was revealed that the isolates varied in their cultural behavior ranging from fluffy to embedded with regular to irregular margins. Colour of colonies varied from white, pinkish, blackish brown to greyish. 50% of the isolates took 10 to 20 days to produce sporulating pycnidia on PDA. 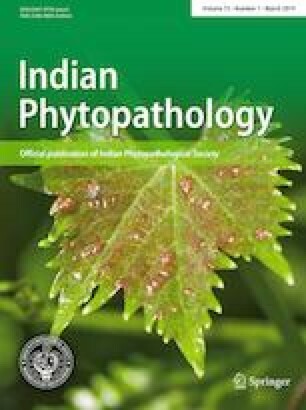 On the basis of disease reaction expressed by different brinjal lines, Pusa Purple Long (PPL) was found to be most susceptible to isolates of P. vexans while as SK-BL-01 was found to be least susceptible. A correction to this article is available online at https://doi.org/10.1007/s42360-019-00135-8. The authors are highly thankful to Head of the Department, Plant Pathology, SKUAST-K and Director Research for facilitating the research work. Sincere thanks are also to Moulana Azad Minority Commission for providing the financial assistance during the course of study.